Boston Red Sox third baseman Pablo Sandoval had a tough night against the Blue Jays on April 9. Not only did he go 0-for-4, with three strikeouts, he nearly lost his pants. 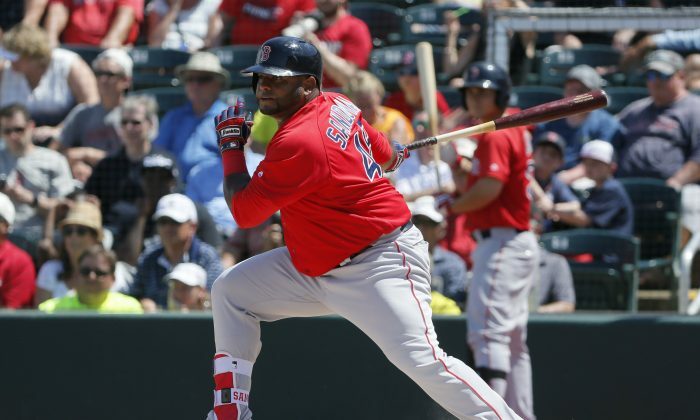 A video shows Sandoval’s belt sliding undone as he swings to hit a pitch from Blue Jays pitcher R.A. Dickey. Sandoval, 5-foot-11 and weighing 255 pounds, then finished the at-bat without a belt and struck out. The team demoted the longtime San Francisco Giants third baseman to a bench role this season—despite owing him more than $75 million over the next four years—in favor of the relatively-untested Travis Shaw. Sandoval hit a career worst .245/.292/.366 (average/on-base/slugging) with just 10 home runs and 47 RBIs last season—his first in Boston after hitting .294/.346/.465 in seven seasons by the bay. Even worse, the switch-hitting Sandoval hit just .049 (2 for 43) as a right-handed hitter against southpaws last year, which neutralized any homefield advantage he had with Boston’s Green Monster in left field. Further hurting him was Sandoval’s defense at the hot corner. Never a Gold Glove winner, Sandoval’s defensive wins above replacement for 2015 was -0.9, according to baseball-reference—his worst since his first full season in 2009. At least his belt has stayed on in the field though. Did Justin Bieber get upstaged by Eric Hosmer at his own concert?